Whitey Herzog managed the Cardinals with a bold, creative style, which partly explains why he largely was successful. What elevated Herzog to Hall of Fame quality is he got his players to buy into that style. A striking example of that occurred on Aug. 28, 1988, in a Sunday afternoon game between the Cardinals and Reds at Cincinnati. 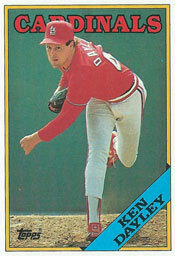 Ken Dayley was one strike away from completing a three-inning save when Herzog abruptly pulled the reliever before he was finished pitching to the batter, Chris Sabo. Dayley didn’t complain nor did anyone else with the Cardinals, which is testament to the trust and respect Herzog had with his players at that time. Bob Forsch, in his last appearance as a Cardinal, started that game and pitched six innings. With the Cardinals ahead, 5-3, Forsch was relieved by Dayley after yielding a leadoff single to Sabo in the seventh. Dayley held the Reds scoreless in the seventh and eighth. In the ninth, Dayley retired the first two batters, then Barry Larkin singled. Up next was Sabo. A right-handed batter, Sabo, a rookie, presented a challenging matchup for the left-handed Dayley. The previous night, Sabo had four hits against the Cardinals, including three singles off left-handed pitching. Cardinals closer Todd Worrell, a right-hander, was warming in the bullpen, but Herzog stayed with Dayley because Kal Daniels, a left-handed batter, was due up after Sabo. Herzog wasn’t figuring on Sabo hitting a home run. Dayley was unscored on in his last seven games. Dayley got the count to 2-and-2 on Sabo. On the next pitch, Sabo drilled a line drive down the left-field line. “It wasn’t foul by much, maybe two feet,” Cardinals left fielder Tom Lawless said. “I’ll bet that was the easiest save he ever had,” Herzog said.